Having a vocation originally meant ‘to be addressed by a voice.’ Examples of this are ubiquitous in the writings of the Old Testament prophets. That’s more or less what happened to me. One night I distinctly heard my name called, not once but thrice, and then again. The ‘wholeness of the group’ sounds like an oxymoron, but it is not; it simply designates our original state of unconsciousness, the participation mystique that we all wallow in before we have differentiated ourselves from the collective. Differentiation is necessary because the call to become whole is not heard en masse. In any group the inner voice is drowned out by convention, and one’s personal vocation is overwhelmed by collective necessity. 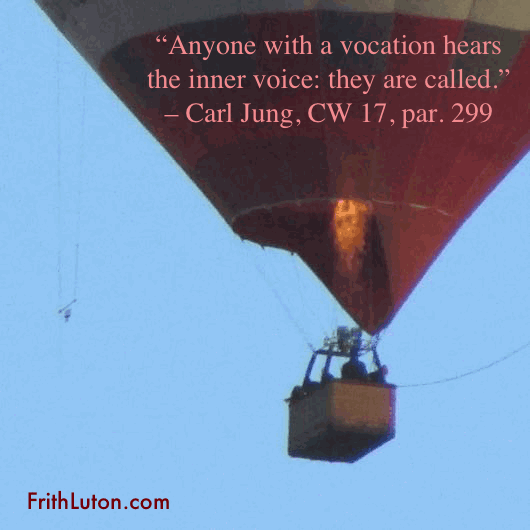 Caveat: In modern times, Goethe and Napoleon heeded inner voices that fuelled their sense of personal destiny. So did Hitler and Stalin, and so do many others diagnosed as psychotic, which just goes to show that inner voices aren’t necessarily benign. Their interpretation depends on a discriminating consciousness in those who hear them.